Pinterest is a popular social networking platform that offers business solid results in sales conversions. It can be a fun and successful way to get people interested in your product. It’s important, however, to pin with purpose if you hope to gain the most return on your time. There are definitely some things you should know when it comes to efficient marketing practices on this platform. 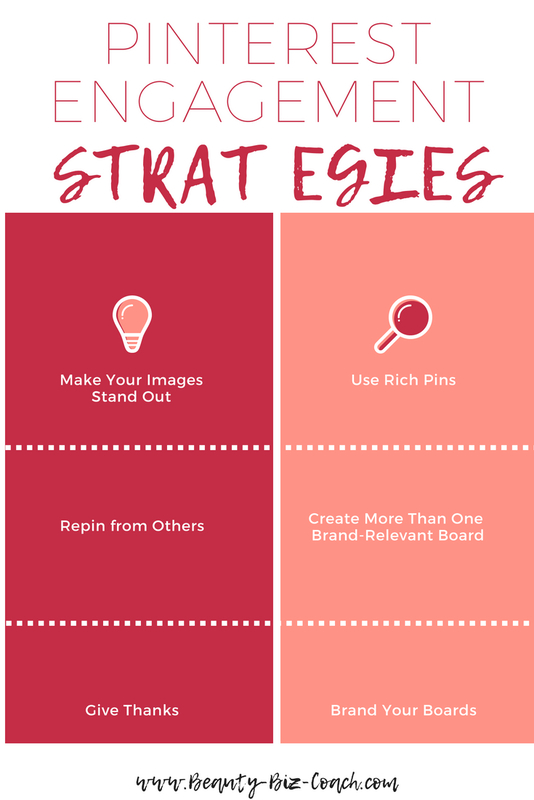 Learn to drive Pinterest engagement with these strategies if you want to create pins that users will love to share. You probably know that visually attractive images are part of a successful Pinterest marketing strategy. You’ll want to give people reason to take a second look at your content and to click on it. So be sure to take great product photos and have someone well-versed in design principles create your pins. You also should know that pins that are long in dimension tend to get more repins than others. Shoot for a size of 730px x 1102px or larger. Infographics work well in this format. Rich Pins are incredibly useful for businesses because they benefit users by providing all the information they need directly on the pin. There are four types from which to choose. Product Pins are geared toward the shopper who wants to have a seamless buying experience. They have information on where to buy the product, its current availability and real-time price. Recipe Pins are a serious cook’s dream because they can find a list of ingredients, serving sizes and cook times directly on the pin in order to make a decision about a particular recipe’s usefulness. Readers will love article pins because there’s a headline with a description of the story all in one place, with no need to click over to an article only to find it’s not at all what was expected. Finally, app pins include an install button, increasing the likelihood that users will download your app due to its ease of use. There is a setup process involved in order to apply for Rich Pins, but it’s fairly painless. Your webmaster can surely help if necessary. It can never be re-stated enough how important it is to give back when using social media. So be sure you’re repinning valuable and relevant stuff from other users. To get started, just type a term related to your brand into the search bar. Look for pins that are attractive to the eye and come from active accounts. You want to associate yourself with other pinners who are consistent in their use of Pinterest and who take time to produce quality content. Choose a pin, save it and add it to one of your boards. To make it easier for your followers to find what they’re interested in and to navigate your boards, you’ll want to arrange them in a well-categorized, efficient manner. You also want to avoid having just one board that contains all of your brand’s pins. Feel free to scatter them about multiple boards to increase the chances of your material being seen. Use simple phrasing for your board titles and include words most associated with your brand. It’s always good to recognize those who have interacted with your brand. For those who’ve pinned your posts, you can add a comment to the pin along with their username to be sure they see your note. You can also send a direct message. Be sure to do this in a way that is not spammy, but genuinely helpful or appreciative. Send a short message to thank customers for making a purchase or to offer pinners a unique discount code for something expressed an interest in through pinning it to their board. Your Pinterest boards can be customized just as other sites can. Use your brand’s color scheme whenever possible and choose pins that have a similar visual appeal to your overall brand image. One fairly easy, yet effective way, to pull your boards together with a cohesive look is to create cover images for each. Enlist a graphic designer or someone on your team to create an image that is 217 x 147 pixels in dimension. Use your colors, fonts or other identifying traits to title each board. Then go to the settings for your boards and add the newly created graphic as the cover of each designated board.